Focused on your estate planning needs, Spencer Law Firm LLC provides clear, effective estate planning assistance to clients who have already devised a will or trust but have additional estate planning needs. Located in Lancaster, Pennsylvania, the firm serves clients locally but also maintains a national expert witness practice. SLF focuses on helping clients protect the assets they have worked hard to acquire. Some aspects of estate planning are complex — particularly those associated with avoiding heavy tax consequences. We work closely with our clients in order to minimize estate taxes such as federal estate and gift taxes, federal generation-skipping transfer taxes, the Pennsylvania inheritance tax, and federal and state fiduciary income taxes. Patti Spencer and her staff bring wisdom and experience to their work with clients and are able to explain complex matters clearly so that clients understand their options and can make informed decisions. Attorney Patti Spencer also provides estate planning consultation services to other lawyers. Comfortable with working directly with firms’ clients or in the background, Ms. Spencer has helped lawyers broaden their trusts and estates practices and more efficiently meet their clients’ needs in-house. 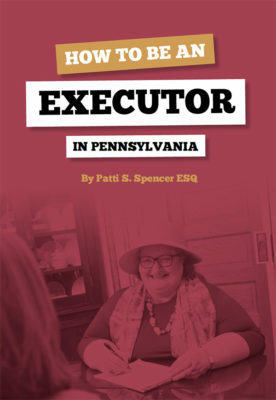 Patti Spencer is also the author of estate planning books which serve as a reference and guide for lawyers and laypeople. Note: For an explanation of these terms, please visit the Glossary page. Contact SLF today for the estate planning assistance you need. Call 717-394-1131 or complete the contact form. This FREE resource will explain the role of an executor, and what executors have to do. It includes a helpful checklist of things to be done.